It is fish season! With Easter brings Lent. With Lent brings all kinds of awesome fresh fish and fish sales. I love fresh water cod. It cooks up so nice and tender. It is really hard to mess up. 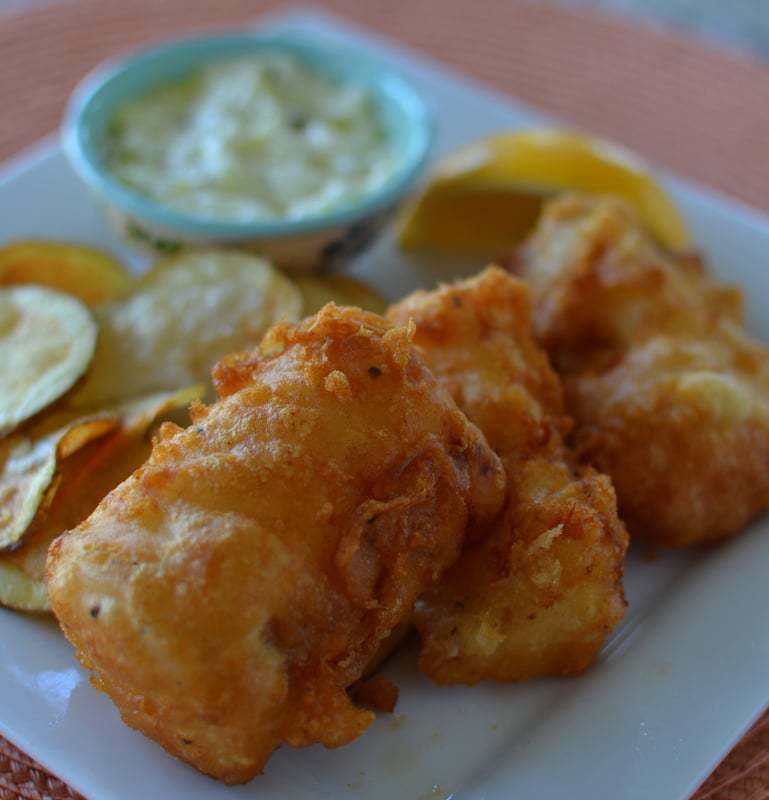 This Beer Battered Fried Cod with Fresh Chips is the prefect recipe for the whole family. My kids love it so much that they are always asking for seconds. 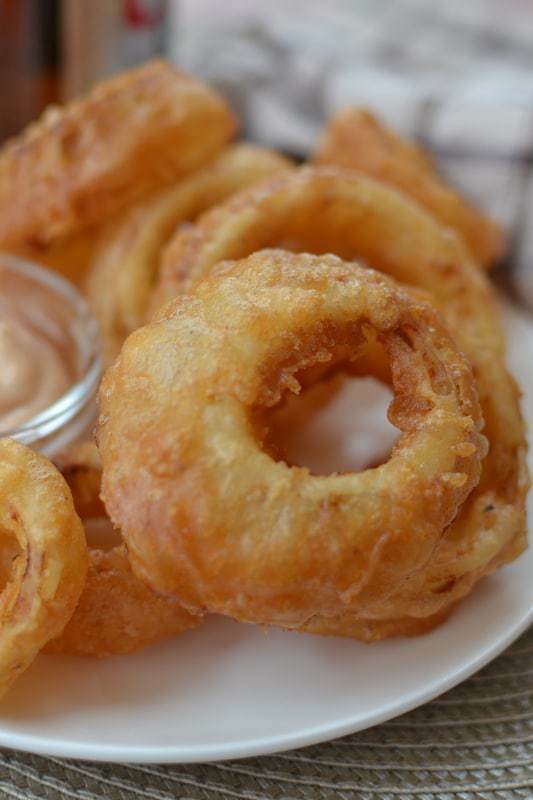 You don’t need to have a deep fryer to make this happen. A heavy duty pot and high temperature candy thermometer will work. It takes a little bit of practice cooking the food in small batches and waiting for the oil to heat back up before adding the next batch. You will need to keep a close eye on the thermostat and make adjustments to try to keep the oil right around 350 to 375 degrees. Too low and you’ll get greasy food, too high and it’ll burn. I brought the deep fryer out for this batch because I was taking pictures and I wanted it as close to perfect as I could. 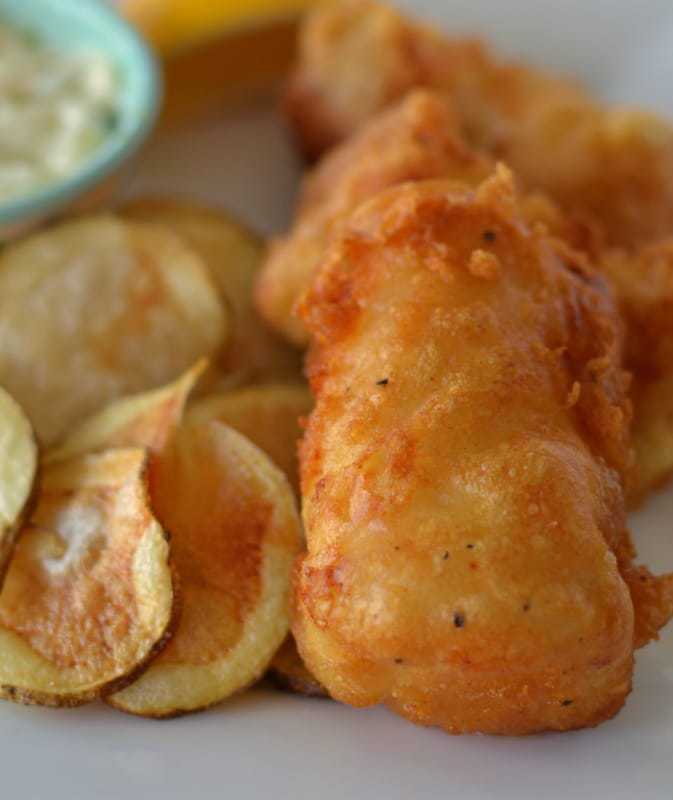 The batter for this Beer Battered Fried Cod with Fresh Chips is so easy to mix up. I just dip the pieces of fish in some flour and dunk them into the batter and use a tongs to take them out of the batter and into the fryer. That way you will not get the dreaded breading fingers. The russet potatoes are sliced thin and added to the fryer. They are fried up golden brown and lightly sprinkled with salt. Cucumber Salad with Lime Vinaigrette, Creamy Parsley Coleslaw, Zesty Sweet Four Bean Salad are all perfect sides for this awesome meal. This Honey Mustard Salmon from Spend with Pennies is a fellow blogger fish favorite. 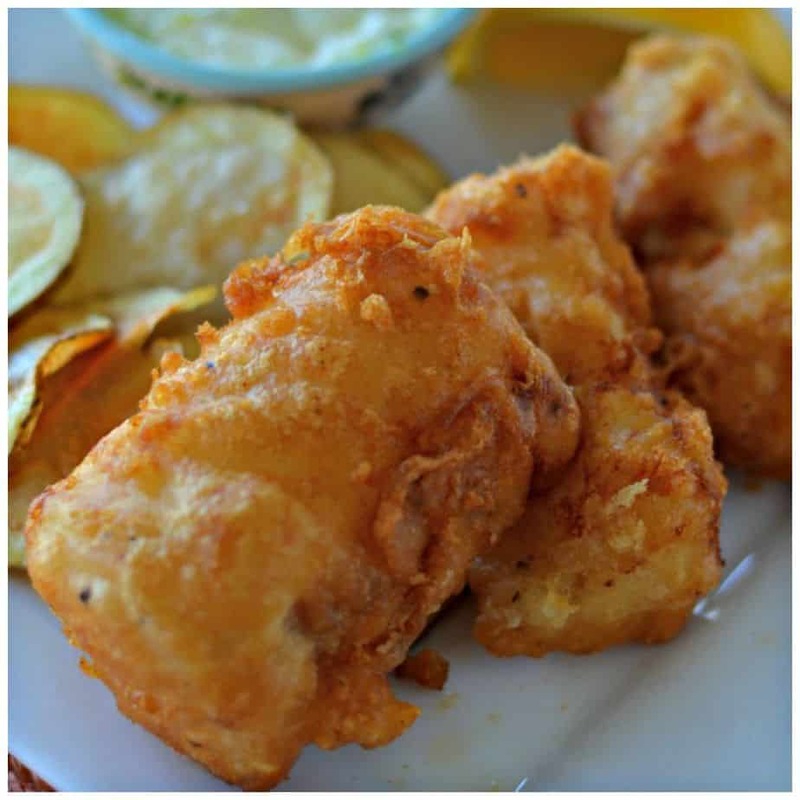 So if you like beer battered fish than you must give this Beer Battered Fried Cod with Fresh Chips a whirl. It is better than any restaurant’s version and a lot easier on the old pocketbook. Set 1/4 cup of flour aside on a shallow plate. 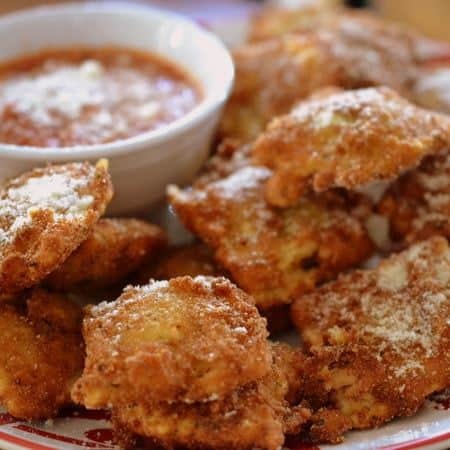 In medium bowl combine 1 cup flour, 1/4 teaspoon ground cayenne pepper, cumin, pepper, garlic powder, onion powder, Cajun seasoning (if adding), beaten egg and 1 cup to 1 1/2 cups beer depending on how thick you want the batter. Dip fish pieces in flour on shallow plate and then into batter. Fry battered fish in the hot oil until browned, about 4 minutes. Place on paper towels while working in small batches. Fry potatoes in small batches until golden brown. Move to paper towels to drain. Lightly salt. I fry about 3/4 of a potato at a time and 2 pieces of fish at a time. I cut my fish in chunks that are about 1 inch thick and 2-3 inches long. I love the Cajun seasoning but for those of you who like it more mild do not add it. You can place everything on paper towels in a shallow metal pan in the oven at 200 degrees while you work. Should it be dark beer or flat beer? No just use a regular beer…not dark and not flat. I have used Coors, Budweiser, Heineken. Just used your batter recipe with sole. The batter was so nice and light, and my wife and myself just loved it. I would say better than Joeys Only. So glad that you and your wife loved it. I will have to try it with some sole!! Yummy!! 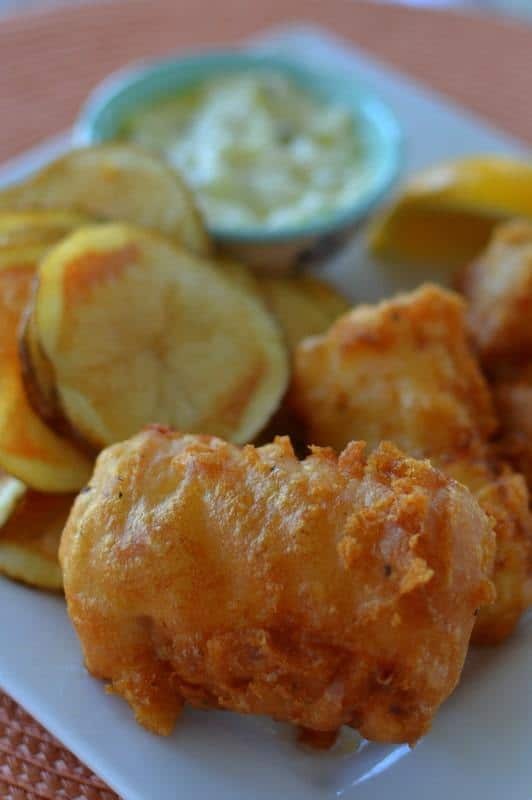 I love fish and want to make it with yhe beer batter. You are going to love it. So good! Thanks for stopping by! Can you use flounder for this? Love fish and chips, but this is the first time I’ve actually made beer battered fish. I used rockfish (a local delicacy here in Monterey area) and it came out awesome! We love it. So delicious! !